Aspen Ski Resort. Come Have Fun in Style. This is one of the best ski resorts in Colorado for skiing steep groomed runs. With more than 3,000 feet of vertical skiing that is accessible from the gondola, there is enough terrain at Aspen to give anyone a work out. Where to rent the best skis in the town of Aspen. Find the best places to stay in Aspen, Colorado. View the highest rated restaurants in Aspen. Lift ticket prices and discount lift tickets. Info about flying into the Aspen/Pitkin County Airport. Photos from around the Aspen area. Bell Mountain Ski Trails – Guide to the back of bell, face of bell, and the rest of this area on Aspen Mountain. Aspen Gondola – Information about the Silver Queen Gondola that rises from the base area to the top of the ski resort. Mid-Mountain Restaurants – Find out about on-mountain lunch and dining options at Aspen Mountain. Aspen Tree Skiing – Where to find the best glade skiing areas on the mountain. 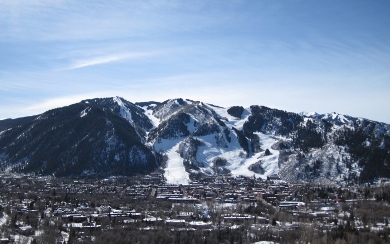 Aspen Mountain Ski Photos – View photos taken at the Aspen Ski Resort during the winter season. Aspen is a beautiful ski town and a wonderful place for a vacation in Colorado. There is a large outdoor pedestrian mall that is located at the heart of Aspen. There is plenty of shopping, fine dining and apres ski activities in this area of town. Aspen is part of the Aspen/Snowmass area which includes 4 ski resorts; Aspen Mountain (Ajax), Aspen Highlands, Buttermilk and Snowmass. You can ski all 4 of these mountains on the same pass and there is a free bus service that runs between each of these mountains.